The beaches I regularly visit on the SE parts of Wisconsin, USA do not seem to have very many people regularly looking for glass. I've seen only a small number of people combing the beach and know of just one person who is regularly out there. I have no problem telling others about a good beach that I know of; I do not often get the chance to speak to fellow combers about finding glass, so I welcome more people at my beach. 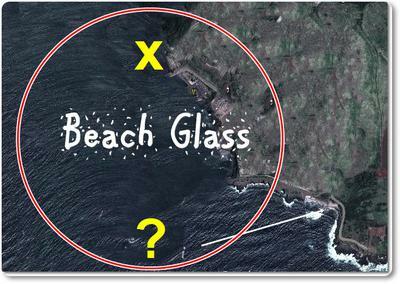 When you visit a beach regularly, you get a great sense of the geography, formation of the land and how that affects glass distribution along the beach. The information regarding which areas of the beach are typically fruitful is not what I'm ready to hand out. That information was resulted from laborious, systematic work, as opposed to simply finding a new beach that is fruitful. The way I look at it is the way I do as a musician. If someone asks how to play a specific song, I'll give them the melody and basic concepts (the beach location), but I'm not keen on giving away the minor inflections I perform that were derived from systematic work. I don't feel as if I own the beach, and welcome as many people that want to be there. A Big Thank You To The Kind Lady From RI!!! And, I want to echo your sentiment to Miles from Milwaukee! Plus, refer both he and "Selkies Sea Glass" to a little thing called "BEACH REPORTS" and such easy, costless random acts of kindness like "paying it forward." Just my 2 cents...and yes, we too love to hunt, find and make jewelry from sea glass, but we do remember where we got our first Beach Report from, as well as the nice locals at the spots we first hunted who DID point us in the right direction. Just remember that you don't own the beach, just your deluded opinions.